Long-acting Injectable (LAI) medications have seen an increase in the variety of options and use in recent years, particularly in the psychiatric population. LAIs have become a mainstay of treatment for patients suffering from chronic illnesses such as schizophrenia and bipolar disorder, with a growing role in substance use disorders.1 While injectable therapy is a promising treatment avenue to promote compliance and improved quality of life, many barriers to patient access still exist. The complicated dosing paired with an administration route that requires a healthcare provider results in deficits in transitions of care and reduced utilization in this patient population. SSM Health DePaul Hospital in St. Louis recognized an opportunity to improve the care of this patient population by establishing an outpatient Long-Acting Injection Clinic. Clinical pharmacists and pharmacy residents collaborated with other healthcare providers to design and launch the LAI Clinic which has resulted in significant improvements in the quality of care for patients. The goals of the LAI Clinic are to improve patient access to providers; remove patient barriers in coverage, including cost through insurance optimization and charity; and remove the financial burden to the hospital by reducing costs and increasing revenue. The LAI Clinic employs several innovative strategies including: LAI antipsychotic per pharmacy protocol for inpatients; complimentary transport to and from the clinic, group or individual therapy, and a fresh meal; pharmacy benefit specialist dedicated to the LAI Clinic, ensuring coverage of medications or facilitating enrollment in patient assistance programs; access to a psychiatrist if needed; and a collaborative practice agreement between the psychiatrist and the clinical pharmacist to facilitate additional capacity and rapid growth of the clinic. The services provided to patients by the LAI clinic are detailed in the appendix in figure 1. SSM Health DePaul Hospital has 125 acute inpatient behavioral health beds and SSM Health is the largest provider of acute psychiatric care in the St. Louis metropolitan area. In 2017, the hospital had 5010 acute inpatient psychiatric admissions and 3487 unavailable psychiatric beds. LAI medications represent a significant portion of care with 680 patients discharged on a psychiatric LAI medication in 2017. The genesis of the LAI Clinic began in spring 2017 with the hiring of a psychiatric clinical pharmacy specialist (CPS) for the inpatient units as part of the hospital's residency program. In the early weeks of establishing a practice, the psychiatric CPS observed that patients who had received LAI antipsychotics were often not achieving the rates of increased compliance and decreased readmission noted in the data. The CPS hypothesized that the LAI’s benefits were not realized in this population due to avoidable lapses in care, specifically at discharge, rather than the efficacy of the agents themselves. A PGY1 resident chose to complete a retrospective review on the appropriateness of LAI antipsychotic dosing, including discharge prescriptions, and its correlation to readmission rates. Early results of the resident project's data created compelling evidence to implement a protocol allowing pharmacists to dose LAI antipsychotics for inpatients, including oral bridging therapy and discharge prescriptions. As a result of the LAI per pharmacy protocol, the psychiatric CPS and inpatient pharmacists became more involved with LAI discharge prescriptions. Several gaps in the transition of care for these patients were found: patients unable to meet required copays/coinsurance, discharge prescription for LAI not generated, suboptimal insurance benefit coverage due to lack of prior authorization for LAIs, lack of availability of psychiatrist visit for additional refills and follow-up after discharge, and inability to follow up at a site that provides injections due to lack of transportation or patient knowledge of sites to administer the injection. The psychiatric CPS championed the establishment of a hospital LAI Clinic to pharmacy leadership. The key outcome of the clinic was to create a clear care pathway that would support medication adherence for patients discharged from the psychiatric unit on LAIs. Pharmacy leadership presented the concept to hospital administration and the premise moved forward as a Lean project in December 2017. The timeline for the LAI clinic is detailed in the appendix in figure 2. The LAI Clinic steering team consisting of representatives from inpatient pharmacy, outpatient pharmacy, business development, psychiatric nursing leaders, social work, and hospital administrators was formed and began work on the LAI Clinic as an A3 project. The steering team used Lean A3 methodology which vetted the concept by examining the current and future states, identifying gaps, and developing possible solutions. Early barriers identified included lack of resources/space, personnel, psychiatrist provider, and workflows for the LAI Clinic. In January 2018, the steering team moved to a 2P event (Preparation/Process) which consisted of frontline staff and experts, including ambulatory care pharmacists, pharmacy benefit specialists (job title is pharmacy concierge), psychiatric clinic nurse, and social workers. The 2P solved gaps of space, people, and workflows. Space which was utilized for outpatient psychiatric group sessions was able to be modified to allow for storage and administration of medication. A psychiatric nurse working in the outpatient psychiatric program had inpatient experience and was able to administer the injections. Workflows which included changes to the EHR for referrals and billing were made. In 2018, the LAI Clinic steering team recruited a psychiatrist (part-time) for the patients at the clinic in addition to his inpatient and office practice. The LAI Clinic began as a pilot in January 2018 with a small number of patients. The Clinic consistently grew at a rate of approximately 20 patients per month, and by May the psychiatrist provider was at patient capacity. The LAI Clinic steering team initiated a rapid improvement event (RIE) which used plan-study-do-act (PSDA) methodology to increase the capacity of the Clinic. The RIE team consisted of psychiatric CPS, pharmacy benefit specialist, inpatient social worker, LAI Clinic nurse, director of the outpatient pharmacy, and Intensive Outpatient Program team leader, with ad hoc specialties such as business development and revenue integrity. The primary outcome of the RIE was the development of a pro forma to appropriately staff the rapidly growing clinic. This led to the addition of a dedicated pharmacy benefit specialist to the clinic and increased pharmacist FTEs which included a collaborative practice agreement between psychiatric CPS and LAI Clinic psychiatrist. The primary route of patient access for the Clinic is internal referral within the SSM Health system. At DePaul Hospital, the psychiatric CPS educates every patient continuing or initiated on an LAI antipsychotic and schedules them an appointment at the clinic that will print on their discharge instructions after their hospital stay. For other hospitals in the region within the SSM Health system, the psychiatric CPS runs a report to determine which patients were discharged with an LAI. The psychiatric CPS, LAI Clinic nurse, and pharmacy benefit specialist call patients, determine their coverage, and assess their needs and desires to attend the clinic. In May, the LAI Clinic began to accept external referrals after requests from other providers in the community. The day prior to a patient's appointment, the nurse calls to provide a reminder and confirm plans for transportation. She then registers the patient, orders lunch and transportation (if necessary), and requests the LAIs to be filled via the outpatient pharmacy. All injections are delivered to the Clinic by 9:30 am the day of scheduled appointments. When patients arrive, they sign in and are escorted to group therapy (or individual therapy if requested) by the LAI Clinic therapist. After group, lunch is served. During lunch, the individual patients are seen by the LAI Clinic physician or psychiatric CPS for assessment and medication changes if necessary. The patient then sees the nurse for an assessment, including vitals, and injection administration. Patients are observed for reactions and given appointment cards as a reminder of the next injection administration date. Patients are then transported home. Any injections of patients that did not show for their appointment are returned to the outpatient pharmacy by the pharmacy benefit specialist. The improvements to the hospital by the LAI Clinic were intended to enhance patient-centered transition of care and sustainment of mental health. The LAI clinic has also produced a self-sustaining financial benefit. Prior to the LAI Clinic, patients receiving discharge injections did not have a consistent care pathway and suffered many disruptions in therapy from hospitalization to discharge. This is a well-known barrier to LAI use in the psychiatric patient population.2 Suboptimal prescribing patterns for patients’ LAIs at discharge in the hospital were confirmed by the hospital's PGY1 pharmacy resident research which showed 38% of a representative sample of discharge prescriptions had incorrect dosing with gaps in oral overlap, titration of the LAI, or lack of prescriptions generated for discharge. A further examination of 68 patients in 2017 showed 89 potentially avoidable readmissions due to errors in LAI discharge orders or lack of follow up care. The financial benefits of the LAI Clinic were achieved through decreased spend on non-reimbursable medications in both inpatient psychiatric wards and outpatient infusion centers as well as increased revenue through the outpatient pharmacy. Increased revenue through the outpatient pharmacy amplifies the program's financial benefit through the hospital's participation in the federal 340B program as a disproportionate share hospital. The outpatient margin (revenue less charity expense and operating costs) on the LAI Clinic patients was positive in January and increased in June. The margin at the hospital is amplified by the 340B program, but the program is viable without 340B. The LAI Clinic patient volume and prescription volume are detailed in table 3 of the appendix. The LAI Clinic provides additional operational benefits for the health-system. During the RIE, the team reviewed the accounts for LAI patients at the hospital's infusion center. The team found 246 patients who were receiving LAIs at the infusion center over a 12 month period for a net financial loss. This was due to various insurers requiring the long acting injection to be billed under the pharmacy benefit rather than medical to receive coverage. The infusion center is a hospital department with medications supplied by the inpatient pharmacy. The hospital infusion center does not fill any medications through the outpatient pharmacy and therefore the patient's pharmacy benefit was not used. Transferring these patients to the LAI Clinic affords the opportunity to use the pharmacy benefit and achieve reimbursement. The result was a double win with decreased write-offs by the infusion center and increased revenue for the LAI Clinic through the outpatient pharmacy. Additional financial benefits to the hospital include decreased inpatient spending on LAI medications. This is achieved by coordination with psychiatric CPS and the LAI Clinic. The psychiatric CPS estimates approximately $85,000 in drug expenditure was saved from January to May 2018. The primary problem the LAI Clinic was founded to improve was the access of LAIs for the hospital’s psychiatric patient population. This was achieved as demonstrated by the rapid enrollment of patients and positive acceptance in the community. The LAI Clinic started with 4 patients in January and by July had a total of 126 active patients. Another metric to measure the success of the LAI Clinic's objective of increasing patient access is through the improved coverage and charity care. The pharmacy benefit specialist is able to obtain coverage for the majority of the patients (June, ~80%) by completing prior authorizations (PAs) for commercial plans and Medicaid if needed or enrolling the patient in patient assistance programs (PAPs). The remaining patients' prescriptions, approximately 20% in June, are filled through a charity fund from positive margin from the LAI Clinic. The LAI Clinic results in demonstrable improvements in the care of patients by affording better access and coverage of LAI treatments. The impact of the program was immediately noticed by the friends and family of these patients who provided many testimonials to the hospital and local news. To date, the Clinic has enabled at least 12 patients to reenter the workforce who previously could not maintain a job due to their debilitating illness; a young female has returned to school to complete her masters level education in psychology; an elderly male who could not form coherent sentences at his first visit now laughs with staff about his relationship with his 7 siblings; a middle aged woman who could not break the cycle of addiction is now sober and in a solid relationship, something she notes she did not ever expect to attain. Countless success stories led a local TV affiliate to interview a patient's family, psychiatric CPS, and hospital personnel about the LAI Clinic in June 2018. This was subsequently picked up by the AP wire and published in national news services. AHRQ Statistical Brief in October 2017 by Fingar and colleagues estimated patients with schizophrenia and related diagnoses had a 30-day readmission rate of 22.9%, the highest single disease for 30-day readmissions.3 As of December 2018, follow up retention rate for the Clinic was 89%. For those patients retained who have been attending the Clinic at least 6 months, they have experienced a 74% decrease in SSM admissions from 6 months prior to their start date to 6 months after, and 81% of these patients experienced zero readmissions within that 6 month period. The Long-Acting Injection Clinic demonstrates its significance to the profession by advancing the responsibility of pharmacists as prescribing authorities both in the inpatient and ambulatory care settings in psychiatry. The development of this clinic has led to an increased value of pharmacists within the hospital’s system, as hospital administration has recognized the importance of pharmacist utilization for appropriate dosing, transitions of care, and provider status. The expertise of the pharmacist in multidisciplinary teams has shown decreased costs for the hospital, improved patient quality of care, increased patient access to care, and generation of revenue that would otherwise be overlooked. The LAI antipsychotic per pharmacy protocol is an established agreement between the psychiatric CPS, an alternate psychiatric residency preceptor, PGY1 residents, and the four primary psychiatrists that service the inpatient psychiatry beds. The EHR pharmacy specialist worked with the psychiatric CPS to create an order allowing psychiatrists to input the LAI antipsychotic of choice and its indication for use. Once the psychiatrist signs the order, all legal requirements of the protocol are associated and the order populates in the verification queue. The pharmacist or resident then performs clinical assessment and places the order for the LAI and its oral counterpart in addition to creating applicable discharge orders in EHR. 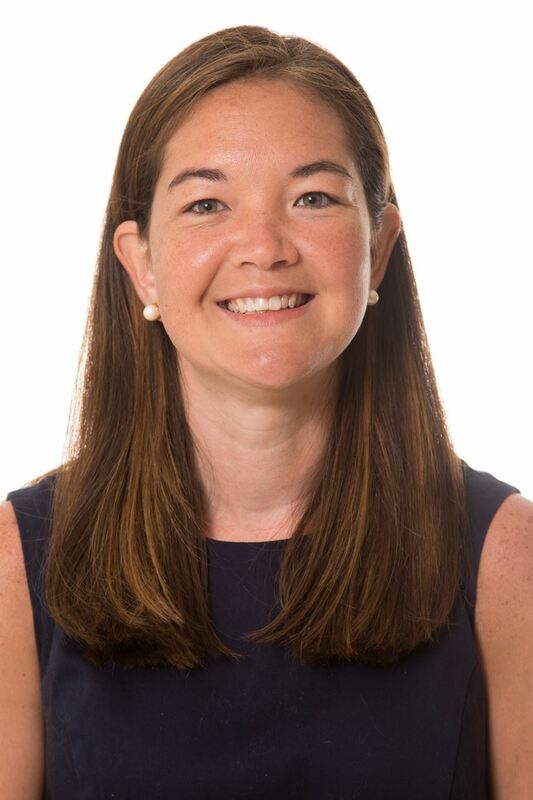 Due to the extreme variability in oral overlap, injectable/oral dosing after a break in therapy, and patient access to injectable medications post-hospital stay, one of the hospital's 2017-18 PGY1 residents found that a significant portion of patients receiving LAIs within the system were dosed inappropriately and did not receive proper follow-up care. Under the LAI antipsychotic per pharmacy protocol, pharmacists are able to prescribe appropriate doses and durations of the LAI antipsychotic and its oral counterpart based on various patient factors, such as: symptomatic control on current oral dose, date of last administration of injection (if applicable), renal and hepatic function, and insurance coverage. Being an integral part of the patient's care during the hospital stay, the pharmacist is then able to educate the patient on their antipsychotic and schedule an appointment with the LAI Clinic for maintenance care. The evolution of the LAI Clinic has led to the significant advancement of pharmacy practice within the field of psychiatry. Due to the lack of outpatient psychiatric care in the region, attaining an appointment with a provider post-hospital stay can take between 120 and 180 days. As most discharge prescriptions do not contain refills, this gap in care feeds the readmission cycle of many psychiatric patients as they often relapse shortly after medication discontinuation. The need for pharmacist involvement into the ambulatory care setting in psychiatry with provider capacity is indisputable. From the relationship built between the LAI Clinic psychiatrist and psychiatric CPS on the inpatient setting via treatment team discussions, treatment recommendations by the pharmacist, and dosing of long-acting injectable antipsychotics through the inpatient protocol, a collaborative practice agreement between the provider and pharmacist was a natural response to the rapid influx of patients to the clinic. At its inception, the collaborative practice agreement allowed psychiatric CPS to initiate, modify, or switch long-acting injectable therapy for the indication provided by the psychiatrist and treat any associated adverse effects with such treatment. The agreement quickly expanded to allow the psychiatric CPS to initiate, modify, or switch treatment for any mental health diagnosis provided by the psychiatrist (e.g., depression) and treat any associated adverse effects. This has further broadened hospital administration and physician perspective of pharmacists as clinical providers within the hospital. Utilization of pharmacist expertise in the creation, implementation, and expansion of the LAI Clinic has proven to be imperative in meeting its initial goals. The unique knowledge and skill set of the pharmacist has allowed an increase in the availability of care in the community, ensured medications are utilized and received in the most cost-effective manner, and provided assurance that patients are maintaining optimum mental health with the least amount of adverse effects possible via appropriate pharmacotherapy choices and dosing strategies. Mental illness is both prevalent and debilitating among adolescents and adults in the United States. Suicidal ideation has been increasing in recent years and with more attention in the social media spotlight1,2. In 2016, suicide was the 10th leading cause of death in the United States, consisting of 44,965 deaths or 1.6% of deaths overall3. Depression is the leading cause of disability in the United States affecting 6.7% of the population which is roughly 16.1 million adults aged 18 years or older4. Treatments for depression and suicidal ideation have evolved over the years and include psychotherapy and various medications. However, a major limitation of these treatment options is a delayed onset of action. New and novel medications have been a major topic of interest in mental health and should be investigated to provide alternative options for those who have failed standard therapy. Over the past decade, ketamine has been increasingly discussed as a useful tool in the management of treatment resistant depression (TRD) and eminent suicidal ideation (SI), and upon recent revelations esketamine seems to provide clinical benefit. Ketamine is a noncompetitive, glutamate N-methyl-D-aspartate (NMDA) receptor antagonist approved for general anesthesia, typically given intravenously. It has been known for its hallucinogenic and dissociative effects, which have resulted in misuse and potential abuse as a street drug. However, ketamine is a promising prospect in treatment resistant major depression and suicidal ideation5. When used for these disorders, the onset of action for ketamine is very rapid (within hours) as compared to the standard therapies which can take weeks to months to reach full effect. Currently ketamine is not FDA approved for depression or suicidal ideation, but has been used off-label in various clinical trials and inpatient settings6. Ketamine infusions are being used nationally and more recently here in Missouri at Missouri Psychiatric Center (MUPC) since November 2018, with very positive results. Typical dosing for anesthesia ranges from 0.5-2mg/kg, but according to the manufacturer’s labeling, can have a max dose of 4.5mg/kg7. The most common dosing of intravenous ketamine for TRD and SI is 0.5mg/kg over 40 minutes. This dosing has been established through numerous trials which have determined it to be the optimal dose for response while minimizing potential side effects. Vidal et al8 conducted a recent study at Geneva University Hospitals with a new rapid intravenous ketamine injection of 0.5mg/kg over 1 minute. The adverse events were similar in nature to the 40 minute infusion, suggesting that this approach could be just as safe and with comparable efficacy. Although no long-term dosing regimen has been established, the amount of infusions needed for remission remains undetermined. Some studies have suggested that two infusions per week for up to six weeks have positive results5,9. Continuation or addition of antidepressants have not been well studied or established to maintain remission in patients treated with ketamine. This gray area of whether to add or keep antidepressant medications is up to the provider of whom is conducting the treatment. A recent breakthrough treatment that has been backed through the FDA advisory board is esketamine. It was voted through by a wide margin; 14 yes votes, 2 no, and 1 abstention10. This backing happened on February 12th, 2019 after a new drug application (NDA) was submitted by Janssen in September 2018. It is an intranasal inhalation of esketamine (Spravato), the S enantiomer and more potent form of ketamine, which is patient administered under medical supervision. Proposed adult dose of esketamine is 28-56mg with each administration and can be titrated to 84mg by week two10. Most common side effects included increased blood pressure, dizziness, and dissociation within the first two hours of administration. As of March 5th, 2019, Spavato (esketamine), in conjunction with an oral antidepressant, has been approved for treatment resistant depression. The FDA states that is must be administered in a certified doctor’s or clinical office and will include a REMS program for safe use11. Campo-Flores A. Another Live-Streamed Suicide Puts Spotlight on Social Media Ethics. The Wall Street Journal. https://www.wsj.com/articles/another-live-streamed-suicide-puts-spotlight-on-social-media-ethics-1485388656. Published January 25th, 2017. Kelly L. Teen suicide rate suddenly rises with heavy use of smartphones, social media. The Washington Times. https://www.washingtontimes.com/news/2017/nov/14/teen-suicides-rise-with-smartphone-social-media-us/. Published November 14, 2017. Facts & Statistics. Anxiety and Depression Association of America, ADAA. https://adaa.org/about-adaa/press-room/facts-statistics. Sanacora G, Frye MA, McDonald W, et al for the American Psychiatric Association Council of Research Task Force on Novel Biomarkers and Treatments. JAMA Psychiatry 2017; 74(4): 399-405. Fond G, Laundou A, Rabu C, et al. Ketamine administration in depressive disorders: a systemic review and meta-analysis. Psychopharmacology 2014;231:3663-76. DailyMed - KETAMINE HYDROCHLORIDE- ketamine hydrochloride injection. U.S. National Library of Medicine. https://dailymed.nlm.nih.gov/dailymed/drugInfo.cfm?setid=58487c78-a641-4278-acc0-343596ee8683. Revised January 30th, 2019. Singh JB, Fedgchin M, Daly EJ, et al. A double-blind, randomized, placebo-controlled, dose-frequency study of intravenous ketamine in patients with treatment-resistant depression. Am J Psychiatry. 2016;173(8):816-826. George J. FDA panel endorses esketamine for depression – Fast-acting nasal spray wins overwhelming support. MedPageToday. Published February 12th, 2019. U.S. Food and Drug Administration. FDA approves new nasal spray medication for treatment-resistant depression; available only at a certified doctor’s office or clinic. FDA.org. Published March 5th, 2019. Mentor: Michelle Jeon, PharmD, BCACP, Assistant Professor of Pharmacy Practice/Clinical Pharmacist - St. Louis College of Pharmacy/Walgreens Co. The highest prevalence on the basis of income was in those who lived below the poverty threshold of $11,670 per year for a single person in 2014 (21.7%). Individuals with migraine experience attacks that may last for several hours to days. Migraines can severely negatively affect quality of life for patients. Affected patients may not be able to participate in daily activities, engage with family and friends, or perform at work. Sunlight, smells, and weather may trigger, amplify and exaggerate symptoms of a migraine. 62% diagnosed with migraine agreed they try to hide the true impact of the headache at work or school. Migraine headaches have a significant impact on quality of life and overall well-being of those who are affected by the disease. AIMOVIG™ (erenumab), AJOVY™ (fremanezumab), and EMGALITY™ (galcanezumab) are CGRP antagonists that were approved by the FDA in 2018 for preventative migraine therapy. This is the first medication class primarily designed to prevent migraines. CLINICAL CONSIDERATIONS All CGRP antagonists are administered via subcutaneous injection. Most agents are administered monthly with the option of AJOVY™, which can be dosed every 3 months. Each pen is available as a standard dose; some regimens may require 2 to 3 consecutive injections to achieve the prescribed dose (Table 2). Hypersensitivity remains the only contraindication for all agents. Patients may continue to use triptans as acute therapy for migraine headaches as no drug interactions exist with CGRP antagonists. * Administration of higher doses will require 2-3 consecutive subcutaneous injections. IMMUNOGENICITY Development of antibodies to the biologic agents was reported in clinical trials. Although the data did not demonstrate a significant impact on product efficacy, there is little data to make definitive conclusions at this point. ADVERSE REACTIONS All agents have similarly shown to cause minimal adverse reactions. Those that occurred in 3% or more of patients were injection site reactions and constipation. MONITORING Number of migraine days per month should be monitored to determine efficacy of the three agents. No safety-related monitoring is required. SPECIAL POPULATIONS Data on efficacy and safety of these agents is limited for use in pregnant, lactating, or pediatric patients. Data is also limited regarding use in elderly; therefore, it is currently recommended to start with low doses in the elderly. Store in refrigerator in original container until ready to use. May remain at room temperature for up to 7 days, discard after. Advantages of therapy with these agents include the minimal risk of adverse effects, and minimal monitoring requirements compared to the currently recommended medications for migraine prevention. The therapy will reduce headache days per month by about 50% of days compared to no medication therapy for migraine prevention in a significant proportion of patients as results of studies have shown. Adverse reactions occurred in a small proportion of participants enrolled in studies and were reported as mild. There is no safety-related monitoring required with the new class of biologic agents. Although the medications are administered via subcutaneous injection, they are dosed only once a month compared to currently recommended preventative oral agents which must be taken every day to achieve migraine prevention. Disadvantages of the new agents include high cost, subcutaneous injection route, and limited data in special populations. On average, CGRP antagonists cost $575 per month. Data on safety in pregnancy would be valuable in determining if the medications have an advantage over other recommended classes, however, there is limited data at this time and use is not recommended. THERAPEUTIC POTENTIAL Currently, these therapies may be considered an alternative to the guideline recommended agents as no trials have compared CGRP antagonists to first line therapy options for migraine prevention. One study including AIMOVIG™ (erenumab) demonstrated its efficacy after patients had failed to experience improvement on at least 2 – 4 other agents.19 Although these agents are the first class to target pathophysiology specific to migraine headaches and are effective with minimal adverse effects, their cost hinders the decision to recommend CGRP antagonists as 1st line preventative treatment options. The subcutaneous route of administration also presents a disadvantage, however, pipeline oral CGRP antagonists are being evaluated in clinical trials.20 As several novel agents have offered new potential for more effective management of migraine, therapeutic options for the prevention of severe disease will likely continue to expand. Are You at Risk for Chronic Migraine? | The American Migraine Foundation. Info.americanmigrainefoundation.com. https://info.americanmigrainefoundation.com/are-you-at-risk-for-chronic-migraine?__hstc=12021355.1c76a0a110f54ade7719b03fdc2c19ba.1533826914624.1538749304730.1539638165880.17&__hssc=62189299.1.1551980429522&__hsfp=404373677&hsCtaTracking=34cc0fdf-2cc3-4bdb-8ec8-71fbbb2f6a0f%7C31afd483-7e65-4d30-8f5a-5083a73b4fc8. Published 2019. Accessed February 1, 2019. Headache Classification Committee of the International Headache Society. The international classification of headache disorders, 3rd ed. Cephalalgia 2013;33(9):629–808. Bigal ME, Ferrari M, Silberstein SD, et al. Migraine in the triptan era: Lessons from epidemiology, pathophysiology, and clinical science. Headache 2009;49:S21–S33. Sprenger T, Goadsby PJ. Migraine pathogenesis and state of pharmacological treatment options. BMC Med2009;7(71):1–5. Noseda R, Burstein R. Migraine pathophysiology: anatomy of the trigeminovascular pathway and associated neurological symptoms, cortical spreading depression, sensitization, and modulation of pain. Pain. 2013;154(suppl 1):S44-S53. doi: 10.1016/j.pain.2013.07.021. Survey reveals many people with migraine live with pain nearly half of every month [news release]. Eli Lilly and Company: Indianapolis, IN; February 20, 2018. www.multivu.com/players/English/8259051-lilly-migraine-impact-report/. Accessed February 15, 2019. Silberstein SD, Holland S, Freitag F, et al. Evidence-based guideline update: Pharmacological treatment for episodic migraine prevention in adults: Report of the Quality Standards Subcommittee of the American Academy of Neurology and the American Headache Society. Neurology 2012;78:1337–1345. Silberstein SD. Practice parameter: evidence-based guidelines for migraine headache (an evidence-based review): report of the Quality Standards Subcommittee of the American Academy of Neurology. Neurology 2000; 55:754. Holland PR, Goadsby PJ. Targeted CGRP small molecule antagonists for acute migraine therapy. Neurotherapeutics. 2018;15(2):304-312. doi: 10.1007/s13311-018-0617-4. Dodick DW, Ashina M, Brandes JL, et al. ARISE: a phase 3 randomized trial of erenumab for episodic migraine. Cephalalgia. 2018;38(6):1026-1037. doi: 10.1177/0333102418759786. Goadsby PJ, Reuter U, Hallström Y, et al. A controlled trial of erenumab for episodic migraine. N Engl J Med. 2017;377(22):2123-2132. doi: 10.1056/NEJMoa1705848. Tepper S, Ashina M, Reuter U, et al. Safety and efficacy of erenumab for preventive treatment of chronic migraine: a randomised, double-blind, placebo-controlled phase 2 trial. Lancet Neurol. 2017;16(6):425-434. doi: 10.1016/S1474-4422(17)30083-2. Stauffer VL, Dodick DW, Zhang Q, Carter JN, Ailani J, Conley RR. Evaluation of galcanezumab for the prevention of episodic migraine. JAMA Neurol. 2018;75(9):1080-1088. doi: 10.1001/jamaneurol.2018.1212. Skljarevski V, Matharu M, Millen BA, Ossipov MH, Kim BK, Yang JY. Efficacy and safety of galcanezumab for the prevention of episodic migraine: results of the EVOLVE-2 phase 3 randomized controlled clinical trial. Cephalalgia. 2018;38(8):1442-1454. doi: 10.1177/0333102418779543. Detke HC, Goadsby PJ, Wang S, Friedman Di, Selzler KJ, Aurora SK. Galcanezumab in chronic migraine: the randomized, double-blind, placebo-controlled REGAIN study. Neurology. 2018; pii: 10.1212/WNL.0000000000006640. doi: 10.1212/WNL.0000000000006640. for prevention of episodic migraine: a randomized clinical trial. JAMA. 2018;319(19):1999-2008. Silberstein SD, Dodick DW, Bigal ME, et al. Fremanezumab for the preventive treatment of chronic migraine. N Engl J Med. 2017;377(22):2113-2122. doi: 10.1056/NEJMoa1709038. Reuter U, Goadsby P, Lanteri-Minet M et al. Efficacy and tolerability of erenumab in patients with episodic migraine in whom two-to-four previous preventive treatments were unsuccessful: a randomised, double-blind, placebo-controlled, phase 3b study. The Lancet. 2018;392(10161):2280-2287. doi:10.1016/s0140-6736(18)32534-0. Biohaven announces robust clinical data with single dose rimegepant that defines acute and durable benefits to patients: the first oral CGRP receptor antagonist to deliver positive data on pain freedom and most bothersome symptom in two pivotal phase 3 trials in acute treatment of migraine [news release]. Biohaven Pharmaceuticals: Los Angeles, CA; April 22, 2018. www.biohavenpharma.com/investors/news-events/press-releases/04-23-2018. It's Friday, the last day of a rotation, and I get a phone call that starts with “I’m so sorry to bother you, but I need some advice about my current student”. The preceptor proceeds to describe how the student has not met any of the deadlines for the rotation, has been late multiple times, absent a handful of times for various reasons, and was caught sleeping during a meeting, all the while seemingly disengaged from the rotation in general. A recipe for disaster. What I love about this phone call is that the preceptor reached out for advice. All too often, I learn about challenging student situations well after the student finished the rotation; or that same student goes on to a later rotation, continuing the same behavior and that preceptor is befuddled at how the last preceptor didn’t address these things and wonders “is it only happening on my rotation?”. What I wish about this phone call is that I received it weeks ago. As preceptors, if you involve your Office of Experiential Education early in a difficult student situation, they are more likely to be able to help both you and the student have a positive outcome. The second ingredient is having timely, productive, and caring conversations. Trust me, I know having these hard conversations isn’t enjoyable. If you haven’t read the book “Crucial Conversations”, I would suggest that as a must read for anyone who is a preceptor (or even if you aren’t).8 This book helps prepare individuals for having tough conversations when the stakes and emotions are high. There is an art to having these conversations and it begins with trying to understand the other person, making the conversation safe, sharing what you are observing, and establishing mutual goals moving forward. There are many dangerous things we can do without having these conversations such as making up our own story about why the student is performing poorly, or assuming the student will change behavior as the rotation advances, or giving up too early on improving the behavior. There are also many dangerous things we can do if we have these conversations poorly. Knowing ourselves and how we handle conflict is the backbone of these conversations; focusing on wanting to see the student succeed is the heart of it. Communication is key! The third ingredient is knowing when and whom to refer the student to. Many times, students that are displaying professionalism issues and even academic concerns can have underlying personal issues. “Lazy” or “poor performance” could be from social stressors affecting home life (which affects professional life), or diagnosed/undiagnosed mental health or other health conditions.4,9 As a preceptor, you are at the front lines mentoring and coaching students and can be the first to recognize a potential personal issue that could be contributing to their performance. The best thing to do is to talk to the student and ask them questions about how they are doing outside of the rotation. Good questions to ask are “how would you say your home life is?” or “how are things at home?” or even “what stressors do you deal with day to day? And have those increased lately?”. I usually start by asking permission to ask these more personal questions. I’ve noticed that students are usually grateful that someone took the time to ask them about their situation versus just pointing out all the ways in which they are not meeting expectation. Depending on what information they share, you can refer them to many of the campus resources including the Counseling Center, Student Affairs personnel, or even the Life Crisis Hotline. When in doubt, let the student know that you are concerned for them and will be reaching out to the Office of Experiential Education for additional support services for the student. It could also be that the student does not have any personal circumstances impacting them, but the referral to the Office of Experiential Education and the Counseling Center can emphasize coping skills and resiliency messaging as well as reiterate the urgency of the situation for them to begin taking the rotation more seriously if they want to be successful. The final ingredient is remembering to document everything. This can be done in a separate file, and/or in the student’s evaluation. Without very specific written examples of the concerning behavior, it will be more challenging later for the student to reflect back on the justification for their poor performance, or for the school to uphold a preceptor’s evaluation if a student files a grade appeal, or for a subsequent preceptor to look back and identify if the student has been struggling with the same issues across multiple rotations (this depends on whether your school has an open portfolio for preceptor evaluations). Additionally, students process things by seeing them written versus hearing it verbally. With very difficult student situations that require lots of documentation, we also advise to document how the verbal conversations went and documentation of the multiple opportunities that were given to the student to improve the behavior/issue. Don’t forget to document positive areas of performance as well! As the age old saying holds true, “it didn’t happen if it wasn’t documented”. In summary, we know it isn’t easy to take time out of your day to teach, mentor, and coach the next generation of pharmacists on top of the expectations of you as the pharmacist. The tag line for the Preceptor’s Handbook for Pharmacists by Cuellar and Ginsburg (which, by the way, every preceptor should own and is full of precepting nuggets of wisdom) is “Being a preceptor is hard work”.10 We say that precepting should be a win-win where students win from hands-on learning experience and preceptors win from having students participate in delivering patient care. When any one situation begins to take over the majority of your time and the win-win feels less and less like anyone is winning, it takes a major toll on preceptors. Using these four ingredients, a dash of patience, and help from your sous-chefs (Office of Experiential Education) will make for the best possible outcome for you and for students. Bodenberg MM, Koehler JM. Customizing student learning during advanced pharmacy practice experiences. Curr Pharm Teach Learn. 2015;7(4):519-525. Boyle CJ, Beardsley RS, Morgan JA, Rodriguez de Bittner M. Professionalism: a determining factor in experiential learning. Am J Pharm Educ. 2007;71(2):Article 31. Hauer KE, Teherani A, Irby DM, Kerr KM, O’Sullivan PS. Approaches to medical student remediation after a comprehensive clinical skills examination. Med Educ. 2008; 42(1):104-112. McLaughlin K, Veale P, McIlwrick J, de Groot J, Wright B. A practical approach to mentoring students with repeated performance deficiencies. BMC Med Educ. 2013;13(1):56. Jackson LD. Can Pharm J. 2015 Nov;148(6):308-313. Patterson, Grenny, McMillan, Switzler. Crucial Conversations: Tools for talking when stakes are high. 2nd ed. Mcgraw-Hill. 2007. Martin RD, Wheeler E, White A, Killam-Worrall LJ. Successful Remediation of an Advanced Pharmacy Practice Experience for an At-risk Student. Am J Pharm Educ. 2018; 82(9):Article 6762. Cuellar LM, Ginsburg DB. Preceptor’s Handbook for Pharmacists. 3rd ed. ASHP. 2016. Approved Contact Hours: One (1) CE(s) per LIVE session. Define the four types of shock and their most common etiologies. Explain pharmacology of clinically relevant vasopressors and their receptor binding capabilities. Summarize the available literature supporting the use of angiotensin-II in distributive shock. Discuss current place in therapy for vasopressors. Shock is a broad term encompassing a disease state characterized by systemic hypoperfusion and organ dysfunction with multiple underlying etiologies. It is a particularly dangerous condition, carrying a mortality rate of at least 25%.1 Well understood shock modalities include cardiogenic, distributive, hypovolemic, and obstructive, with distributive being the most common. 2 Table 1 outlines common causes for each shock subset. Although the term shock has been in the literature for decades, diagnosis and treatment of the condition, especially septic shock, has undergone several revisions. In distributive (vasodilatory) shock, a leaky vasculature leads to low systemic vascular resistance and hypotension in the presence of preserved cardiac function. Treatment consists of fluid resuscitation with the addition of vasopressors for fluid-refractory shock. The goal of vasopressors in this situation is to cause vasoconstriction and thereby increase systemic vascular resistance. In contrast, cardiogenic shock involves decreased cardiac output due to diminished work of the heart. Positive inotropes can be utilized in this setting to increase contractility of the heart and subsequently improve blood pressure. Obstructive and hypovolemic shock rarely require vasopressors as the underlying mechanism should be identified and treated accordingly. In order to better understand why certain vasopressors are preferred in the guidelines, it is essential that pharmacists stay up-to-date on current literature. Therefore, this article will focus on mechanisms of action and place in therapy for vasopressors, as well as current evidence and role of the new vasopressor, angiotensin II. Vasopressin’s ability to increase blood pressure stems from inhibition of nitric oxide production and direct constriction of vascular smooth muscle. Vasopressin-modulated increase in vascular sensitivity to catecholamines may further potentiate its pressor activity.3 Next, phenylephrine is the only vasopressor that selectively stimulates alpha1 receptors. Although it has no effect on beta receptors and heart rate, reflex tachycardia can develop with rapid changes in blood pressure.3 It should be noted that initiating phenylephrine in patients with already diminished myocardial function may have deleterious effects on cardiac output due to increasing systemic vascular resistance and further increasing demand of the heart. Lastly, the newest vasopressor, angiotensin II, acts on a completely different pathway from the adrenergic and vasopressin systems. Activation of this third system, the renin-angiotensin-aldosterone system (RAAS), through administration of angiotensin II produces potent vasoconstriction of arterioles and increases in blood pressure. Table 2 summarizes mechanisms of action for each vasopressor. Angiotensin II hasn’t had a strong evidence base for inclusion in practice guidelines due to a lack of clinical data. As such, many clinicians have chosen not to consider angiotensin II as a therapeutic option, instead favoring treatments with well-documented data such as the other agents listed in Table 2. Considering the high mortality burden of vasodilatory shock and the adverse effects that are associated with the commonly used vasopressors, the use of angiotensin II has increased in popularity. In an effort to further explore the use of angiotensin II as a treatment option, researchers prepared a high-quality trial known as Angiotensin-II for the Treatment of Vasodilatory Shock (ATHOS-3). At hour 3, there were statistically more patients in the angiotensin II group that met the primary outcome measure (69.9% vs 23.4%, p<0.001; odds ratio [OR] 7.95; 95% confidence interval [CI] 4.76 to 13.3). Cardiovascular SOFA scores were statistically lower in the angiotensin II group than in placebo (-1.75 vs -1.28 respectively, p=0.01). The mean change in SOFA score between groups was not statistically significant (p=0.49). Mean change in norepinephrine-equivalent dosage from baseline to hour 3 was statistically significant (-0.03 ± 0.1 vs. 0.03 ± 0.23, p <0.001). Angiotensin II did not improve all-cause mortality over placebo at day 7 (29% vs 35% respectively; hazard ratio [HR] 0.78; 95% CI 0.53-1.16) or at day 28 (46% vs. 54% respectively; HR 0.78; 95% CI 0.57-1.07).7 There were no significant differences in adverse events between groups reported in the study, however, FDA labeling for angiotensin II warns of increased incidence of arterial and venous thromboembolic events compared to placebo-treated patients (13% vs. 5% respectively).8 Results of the study are summarized in Table 3. There are several published studies comparing norepinephrine to dopamine or epinephrine. One such study (SOAP-II) found no difference in 28-day mortality, but a higher incidence of arrhythmias in the dopamine group.9 Similar results have been demonstrated with trials comparing norepinephrine to epinephrine.10,11 Therefore, norepinephrine is currently recommended as the first line vasopressor in septic shock refractory to fluid resuscitation and epinephrine can be initiated in addition to norepinephrine to further increase MAP.6 Dopamine or vasopressin may also be used in septic shock. However, dopamine should only be initiated in patients at low risk of tachyarrhythmias due to the results from the SOAP-II trial. Furthermore, guidelines recommend initiating vasopressin in addition to norepinephrine to further increase MAP or to decrease norepinephrine dosage.9 In contrast to vasopressin, phenylephrine has limited use in septic shock and is not recommended in the guidelines. However, one advantage of phenylephrine is that it comes manufactured as a “push dose” and is often utilized in operating rooms for transient hypotension to avoid running a vasopressor infusion. Lastly, current data does not support the use of angiotensin II as first line therapy for septic shock. Based on the ATHOS-3 study, angiotensin II may be used in addition to norepinephrine in refractory shock similar to epinephrine or vasopressin. There are three main systems that current vasopressors act on: the adrenergic, vasopressin, and renin-angiotensin-aldosterone system. Norepinephrine, epinephrine, phenylephrine, dopamine, and vasopressin have all been extensively studied. Common reasons for initiating these vasopressors include septic shock, anaphylactic reactions, or during advanced cardiac life support (ACLS). Angiotensin II is a novel vasopressor that acts on the renin-angiotensin-aldosterone system, a mechanism not previously utilized by the aforementioned vasopressors. The ATHOS-3 study supports the use of angiotensin II as an addition to norepinephrine for vasodilatory shock to reduce vasopressor requirements, increase MAP, and reduce the cardiovascular SOFA score, making angiotensin II a strong consideration for this subset of patients. The General Assembly Kicked off its 100th year on January 9, 2019 and will close its session at 6pm on May 17, 2019. Since the kickoff, lawmakers have been entrenched in the policy process in which a bill becomes a law. And this year, a number of bills have been introduced in both the house and senate that would impact pharmacy and the care of our patients. In this article, we list the pharmacy-related bills and walk through how a bill becomes a law. Each of these bills have been introduced in their respective chamber. Click here to look up these bills and see where they are in the policy process. Legislators may file and introduce bills to their respective chamber (i.e. House or Senate). The last day to introduce a bill is the 60th day of the session. Each bill introduced has a first and second reading. Following the first reading, it is placed on the calendar for a second reading. Following the second reading, the bill will be assigned a committee. The committee will hold a public hearing for each bill that is assigned to it. In a public hearing, the sponsor will introduce the bill to the assigned committee. Additionally, proponents and opponents will be invited to provide a testimony. When a bill receives a positive recommendation, it is placed on the calendar to be “perfected” by the full chamber. Any bill passed out of one chamber will be introduced in the opposite chamber and will go through steps one through four again. Bills that have passed by majority of both chambers are designated as “Truly Agreed To and Finally Passed” and signed by both the Speaker of the House and President Pro Tem of the Senate. Once signed by the Governor and filed with the Secretary of State, a bill will go into effect as a law ninety days after the close of the General Assembly session. Laws are published in Laws of Missouri. Recall non-pharmacological prevention recommendations made in the 2016 Infectious Disease Society of America Aspergillosis guidelines. Select and recommend appropriate initial antifungal therapy for invasive aspergillosis. Compare and contrast differences in adverse effect profiles between antifungal agents. IA primarily involves the sinopulmonary tract, as inhalation is the most common portal of entry and transmission. The onset of clinical presentation may range from days to weeks with symptoms including facial swelling, nose bleeds, fever, cough, and dyspnea. Invasion of the vasculature may manifest effects such as chest pain or hemoptysis. As IA clinical manifestations are nonspecific, it remains difficult to diagnose; thus, utilization of appropriate diagnostic tools is crucial. The chest computed tomography (CT) scan is recommended in suspected invasive pulmonary aspergillosis regardless of other chest radiograph results due to its much higher sensitivity in lesion identification. Typical features of invasive pulmonary aspergillosis on CT imaging include nodules, consolidative lesions, wedge-shaped infarcts, and the characteristic feature includes a “halo sign.” The “halo sign” is particularly seen in neutropenic patients and is defined as a nodule greater than 1 centimeter in diameter surrounded by ground-glass opacity. Upon recognition of a halo sign, treatment initiation is warranted as it has demonstrated improvement in clinical response. Bronchoalveolar lavage (BAL) is an alternative in patients with suspicion of invasive pulmonary aspergillosis and remains a cornerstone diagnostic test for microbiological identification in diffuse interstitial or alveolar lung infiltrates. Cells and other components from bronchial and alveolar spaces are obtained in this relatively safe and well tolerated procedure. However, due to being an invasive procedure, it requires patient consent, sufficient patient respiratory capacity, and no major bleeding diathesis that precludes BAL. Therapy should be initiated if findings return with high suspicion of aspergillosis. Blood or respiratory fluid cultures can be obtained to aid in the diagnosis of aspergillosis infections. It is a common practice to obtain cultures during suspected infection and any growth can further support treatment. Standard and special fungal stains should be performed simultaneously with fungal-specific media during suspected fungal infection. Aspergillus spp. typically grows on most media in approximately 2-5 days. Therefore, incubation period should be at least 5 days. Despite this, culture yield is low and a negative culture does not definitively exclude the diagnosis of IA. Galactomannan assay is recommended as an accurate marker to diagnose IA when used in certain patient populations including hematologic malignancy or hematopoietic stem cell transplant. Studies have demonstrated good sensitivity at approximately 70%. It can be obtained from blood or bronchoalveolar lavage. However, galactomannan is not recommended to be routinely used in solid organ transplant patients or those with chronic granulomatous disease. Studies have shown galactomannan sensitivity in non-neutropenic patients appears to be lower in other groups and decreases to approximately 20% in solid organ transplant patients. Polymerase chain reaction (PCR) has been highly debated for its clinical utility in diagnosing IA. Due to limited supporting evidence, recommendations to use PCR routinely cannot be made. IDSA recommends clinicians utilize PCR assays only in conjunction with other diagnostic tools and interpret results accordingly, maintaining awareness of the methodologies and performance characteristics of the specific assay used. Patient populations at risk for IA include those with prolonged neutropenia, recipients of allogeneic hematopoietic stem-cell or solid organ transplant, acquired immunodeficiency syndrome, chronic granulomatous disease, recipients of immunosuppression agents, defective nicotinamide adenine dinucleotide phosphate (NADPH) oxidase, coexisting conditions such as diabetes and malnutrition, recipients of high doses of glucocorticoids, and pre-existing structural lung disease (emphysema, previous cavitary tuberculosis, etc.). High-risk patients are recommended to reduce mold exposure, such as avoidance of gardening, spreading compost, or exposure to construction. IDSA guidelines strongly recommend early initiation of the primary treatment with voriconazole as soon as infection is suspected rather than delaying therapy. Treatment duration should encompass a minimum of 6 to 12 weeks, depending on infection severity. Alternative therapies include liposomal/lipid complex Amphotericin B and isavuconazole. Table 1 in the supplementary appendix provides direct comparisons between each antifungal medication, routes of administration, and common adverse effects. Table 2 in the supplementary appendix summarizes dosing, renal dose adjustments, and hepatic dose adjustments between each antifungal agent. Triazoles are preferred agents for treatment and prevention in patients with or at risk for IA. Voriconazole has become the primary drug of choice for invasive aspergillosis based on a pivotal randomized, unblinded, controlled trial that compared patients who received voriconazole and amphotericin B deoxycholate for primary therapy of invasive aspergillosis. In this trial, voriconazole demonstrated superior antifungal efficacy through improved survival benefit in patients at week 12 and significantly fewer adverse events.7Since that pivotal trial, the results of multiple cohort studies further support voriconazole compared with other intravenous therapies. Isavuconazole serves as an alternative primary agent as supported by the results of a phase III, randomized-controlled, non-inferiority trial that compared isavuconazole with voriconazole for suspected mold disease. Isavuconazole demonstrated to be noninferior to voriconazole in efficacy and was well tolerated compared to voriconazole with fewer adverse events during the study.8 However, there is limited data that exists outside of this single study which led to Food and Drug Administration (FDA) approval in 2015 and the cost is also significantly higher as compared to voriconazole. Posaconazole and itraconazole are considered for salvage therapy. Itraconazole does not exist in an intravenous formulation and capsules require a low gastric pH for absorption. The suspension formulation shows favorable absorption, but has a higher association with gastrointestinal side effects. Posaconazole has primarily only been studied in prophylaxis and steady-state levels may not be achieved for up to a week, limiting its use. Triazole antifungals have proven to be difficult to initiate in patients with pertinent drug-drug interactions with their other required medications. Clinical judgement should be used to evaluate patients on a case by case basis and establish appropriate monitoring parameters for those who continue concomitant therapy. Echinocandins include caspofungin, micafungin, and anidulafungin. These agents have extensive half-lives, which provides ease with once-daily dosing. This class distributes well into all major organ sites except the eye and does not require renal dose adjustment. However, echinocandins are only available as parenteral administration. Anidulafungin is not approved by the FDA for IA and caspofungin is significantly more expensive than micafungin making micafungin a desirable choice from this class. Echinocandins can be used in combination with other antifungal agents. For salvage therapy, the use of monotherapy or combination therapy is appropriate. However, the IDSA recommends against routine use as monotherapy for invasive aspergillosis due to limited data. The use of echinocandins in combination therapy provides a multimodal approach with differing mechanisms of action. Additionally, combination therapy is supported by a study comparing therapy with voriconazole plus anidulafungin versus voriconazole alone in a subgroup of patients with hematologic malignancies and hematopoietic cell transplantation diagnosed with invasive aspergillosis did not demonstrate statistical significance, but showed a trend towards increased 6 week survival.9 While there are no strong recommendations regarding combination therapy, the safety and tolerability of echinocandins supports it as a reasonable option to initiate as add-on therapy in severe or refractory disease. Recommend primary treatment of IA with voriconazole. Early empiric initiation in patients with strongly suspected IA is warranted. Alternative therapies include isavuconazole or liposomal/lipid complex amphotericin B depending on organ dysfunction, toxicities, and tolerability. Combination therapy with voriconazole and an echinocandin can be considered in select patients based on severity or refractory to initial treatment. Primary therapy with an echinocandin is not recommended. Treatment duration should be a minimum of 6-12 weeks, largely dependent on degree and duration of immunosuppression, site of disease, and evidence of improvement. Barnes PD, Marr KA. Aspergillosis: spectrum of disease, diagnosis, and treatment. Infect Dis Clin North Am. 2006;20(3):545-561, vi. Centers for Disease Control and Prevention. Aspergillosis statistics. October 12, 2017; https://www.cdc.gov/fungal/diseases/aspergillosis/statistics.html. Assessed November 29th, 2018. Kontoyiannis DP, Marr KA, Park BJ, et al. Prospective surveillance for invasive fungal infections in hematopoietic stem cell transplant recipients, 2001-2006: overview of the Transplant-Associated Infection Surveillance Network (TRANSNET) Database. Clin Infect Dis. 2010;50(8):1091-1100. Patterson TF, Thompson GR, Denning DW, et al. Practice guidelines for the diagnosis and management of aspergillosis: 2016 update by the Infectious Disease Society of America. Clin Infect Dis. 2016;63(4):e1-e60. Segal BH. Aspergillosis. N Engl J Med. 2009:360(18):1870-1884. Herbrecht R, Denning DW, Patterson TF, et al. Voriconazole versus amphotericin B for primary therapy of invasive aspergillosis. N Engl J Med. 2002;347(6):408-415. Maertens JA, Raad II, Marr KA, et al. Isavuconazole versus voriconazole for primary treatment of invasive mould disease caused by Aspergillus and other filamentous fungi (SECURE): a phase 3, randomised-controlled, non-inferiority trial. Lancet. 2016;387(10020):760-769. Marr KA, Schlamm HT, Herbrecht R, et al. Combination antifungal therapy for invasive aspergillosis: a randomized trial. Ann Intern Med. 2016;162(2):81-89. AmBisome® [package insert]. San Dimas, CA: Gilead Sciences, Inc.; 2012. VFEND® [package insert]. New York City, NY: Roerig; 2010. SPORANOX® [package insert]. Titusville, NJ: Janssen Pharmaceuticals, Inc.; 2017. Noxafil® [package insert]. Whitehouse Station, NJ: Merck Sharp & Dohme Corp.; 2015. CRESEMBA® [package insert]. Northbrook, IL: Astellas Pharma US, Inc.; 2015. CANCIDAS® [package insert]. Whitehouse Station, NJ: Merck & Co., Inc.; 2005. Mycamine® [package insert]. Deerfield, IL: Astellas Pharma US, Inc.; 2007. Identify key differences between indications and dosing requirements for oral anticoagulants. List risk factors for bleeding complications caused by oral anticoagulation. Describe current and developing oral anticoagulant reversal strategies in patients with life-threatening bleeding. Explain the mechanism of action of each anticoagulant reversal agent. Evaluate current literature pertaining to reversal strategies in patients taking oral anticoagulants. In patients with high risk of bleeding, reversal of anticoagulation may be necessary. Some approaches to managing acute bleeding may include mechanical intervention or administration of antidotes. This review will assess the role of possible antidotes for oral anticoagulants, including warfarin, dabigatran, and Factor Xa inhibitors. For example, a retrospective cohort study assessed the safety, efficacy, and cost of a fixed dose PCC (Kcentra®) protocol. This study included adult patients receiving 1500 IU of PCC per the hospital’s protocol for any clinical indication for emergent VKA reversal and who were on chronic VKA therapy (mean presenting INR 3.3). Of the 39 included patients, 71.8% received PCC for an intracranial bleed. Their mean age and weight were 70 years and 79.5 kg respectively. With a single dose of 1500 IU PCC, 92.3% of patients’ INRs decreased to less than 2.0, and 71.8% of patients’ INRs successfully decreased to less than or equal to 1.5. One patient required a second dose of PCC, and no patients experienced a thromboembolic event within seven days. This study concluded that 1500 IU PCC was safe and efficacious for emergent warfarin reversal. While this study identified cost-savings, they did not directly compare these results to a variable dosing strategy. Additionally, patients with a presenting INR of less than 2.0 (n=4) and patients receiving FFP (n=11) were included, which may confound results.14 Because the mean presenting INR in this study was 3.3, it is also difficult to assess PCC’s efficacy and safety in patients with significantly higher INRs at baseline. Few studies have evaluated the safety and efficacy of fixed-dose PCC in comparison to variable dose PCC. However, reported studies show promising utility. The reported fixed-dose PCC studies have shown to be effective and offer similar outcomes as the landmark trials approving variable dose PCC. However, studies assessing fixed dose PCC included varying populations, making extrapolation of results challenging. For example, studies have not assessed the use of fixed dosing in the extremes of weight where the fixed dose may vary significantly when compared to variable dosing strategies. Because fixed dose PCC for the reversal of major bleeding has not been FDA approved, this may pose as an ethical dilemma if the fixed dose chosen is significantly higher or lower compared to a patient’s ultimate variable dose. Additionally, studies assessing the safety and efficacy of PCC for intracranial hemorrhages utilize varying fixed doses, so this niche population needs further study. An update to this study was published about a year after the interim analysis of RE-VERSE AD and included an additional 43 patients. Thus, a total of 123 patients (66 in group A and 57 in group B) were included in the analysis.20 Baseline characteristics remained about the same as in the interim analysis, and 95% of patients received dabigatran for the indication of stroke/systemic embolism prophylaxis in NVAF. With regard to the primary outcome, Pollack and colleagues found that complete reversal of dabigatran occurred in over 89% of patients, and the median time to cessation of bleeding in 48 of the group A patients was 9.8 hours.20 Additionally, mean time to surgery in group B patients was approximately 1.7 hours after infusion of idarucizumab with no major bleeding occurring post-surgery. Thrombotic events occurred in five patients over a 24-day post-infusion period; however, none of those patients were anticoagulated during that time. Death occurred in 21% of patients, but these were not found to be directly related to use of idarucizumab.20 Overall, this study continued to show that idarucizumab can rapidly and completely reverse dabigatran, reduce time to surgery or an urgent procedure, and achieve hemostasis within approximately ten hours. In terms of the primary outcome, only 47 of the 67 patients were analyzed because 20 patients had baseline anti-factor Xa levels that were too low or missing. Overall, patients who were taking either rivaroxaban or apixaban before receiving andexanet alfa experienced a decrease in anti-factor Xa activity of 89% and 93% (respectively).23 However, four hours after the end of the infusion, this decrease was only 39% in the rivaroxaban arm and 30% in the apixaban arm. Clinical hemostasis was considered “excellent” or “good” (assessed by an adjudicator) in 79% of the patients in the efficacy subgroup (n=47) 12 hours after the infusion. Furthermore, in terms of the safety population (n=67), 12 patients (18%) experienced thrombotic events during the 30-day follow-up, and 10 patients died (15%).23 Although the results of this study make andexanet alfa an interesting option for reversal of FXa inhibitors, a major limitation is the exclusion of many surgical patients. Most patients were determined to achieve hemostasis 12 hours after the infusion, but given its short half-life, it is unclear if surgical patients will have adequate anticoagulant reversal prior to a procedure. This study is ongoing, and more studies are necessary to determine the most appropriate indications for andexanet alfa. Ciraparantag (PER977) is a new, investigational drug that is being developed for use as a potential reversal agent for both FXa inhibitors and factor IIa inhibitors.26 The exact mechanism of ciraparantag is unknown but in vitro studies have shown that it binds to anticoagulants via noncovalent hydrogen bonds. A study by Ansell and colleagues assessed the safety and efficacy of this agent when given as monotherapy and after a 60 mg dose of edoxaban in 80 healthy volunteers.26 In this study, whole-blood clotting time was used as means to determine the anticoagulant effect of edoxaban as well as assess the efficacy of ciraparantag. The patients were given a dose of edoxaban followed by a single intravenous dose of ciraparantag (ranging from 25 mg to 300 mg) or placebo three hours later. Patients who received ciraparantag 100 mg or 300 mg demonstrated a statistically significant decrease in whole-blood clotting time to within 10% of the baseline value, which occurred within 10 minutes. Conversely, it took patients in the placebo arm roughly 12 to 15 hours to reach a similar decrease in whole-blood clotting time.26 Furthermore, patients maintained the reduction in whole-blood clotting time for 24 hours after the administration of one dose of ciraparantag. Procoagulant activity of ciraparantag was not evident based on D-dimer levels, TFPI levels, and whole-blood clotting time. Overall adverse events were transient, mild, and/or not related to ciraparantag.26 There are more studies to come involving this new agent, which will determine if its reversal ability is similar with the other direct oral anticoagulants. Lots of patients require anticoagulation for a variety of indications which puts these patients at an increased risk of bleeding. Educating patients on the appropriate use of their anticoagulant therapy, as well as encouraging adherence, is key in order to help improve safety and efficacy. Specifically, providers need to be aware of other concomitant bleeding risk factors that their patients may have so that modifiable risk factors can be mitigated, and the most appropriate anticoagulant regimen is selected. Warfarin has therapeutic monitoring, which can help identify patients who are at a high risk of bleeding. Additionally, there are well-studied reversal strategies, including vitamin K and PCC. However, warfarin reversal strategies are continuing to be evaluated regarding fixed versus variable dosing of PCC. Unlike warfarin, DOACs do not require therapeutic monitoring, so their use continues to increase; however, because of the lack of sensitive therapeutic monitoring, correlating a patient’s bleed to the use of a DOAC can be more challenging. Thus, appropriate supportive care and treatment options need to be available for patients in the event of bleeding directly related to a DOAC. The current FDA-approved reversal agents for DOACs include idarucizumab and andexanet alfa. Idarucizumab is only indicated for the reversal of dabigatran, and it has been shown to be safe and efficacious in various patient populations, including those who require urgent surgical intervention. Conversely, andexanet alfa is indicated for the reversal of rivaroxaban and apixaban, and studies have shown that it can quickly reverse levels of these FXa inhibitors; however, because of its short half-life, it has not been well studied in patients requiring acute surgical intervention. Given that the aforementioned reversal agents are relatively new to the market, more data is needed in order to determine their optimal use. Currently, more patients are being enrolled in studies assessing the use of these agents, and newer agents are being developed (i.e. ciraparantag) which may potentially provide even more options available for providers to use in the setting of acute bleeding caused by DOACs. Coumadin (warfarin) [prescribing information]. Princeton, NJ: Bristol-Myers Squibb Company; October 2011. Pradaxa (dabigatran) [prescribing information]. Ridgefield, CT: Boehringer Ingelheim; November 2015. Xarelto (rivaroxaban) [prescribing information]. Titusville, NJ: Janssen Pharmaceuticals, Inc; August 2016. Eliquis (apixaban) [prescribing information]. Princeton, NJ: Bristol-Myers Squibb; July 2016. Savaysa (edoxaban) [prescribing information]. Parsippany, NJ: Daiichi Sankyo, Inc.; September 2016. Apostolakis S, Lane DA, Guo Y, et al. Performance of the HEMORR(2)HAGES, ATRIA, and HAS-BLED bleeding risk-prediction scores in patients with atrial fibrillation undergoing anticoagulation: the AMADEUS study. J Am Coll Cardiol. 2012;60(9):861-7. Nutescu EA. Oral anticoagulant therapies: balancing the risks. Am J Health Syst Pharm. 2013;70(10 Suppl 1):S3-11. Cuker A, Siegal DM, Crowther MA, Garcia DA. Laboratory measurement of the anticoagulant activity of the non-vitamin K oral anticoagulants. J Am Coll Cardiol. 2014;64(11):1128-39. Holbrook A, Schulman S, Witt DM, et al. Evidence-based management of anticoagulant therapy: Antithrombotic Therapy and Prevention of Thrombosis, 9th ed: American College of Chest Physicians Evidence-Based Clinical Practice Guidelines. Chest. 2012;141(2 Suppl):e152S-84S. Kcentra (prothrombin complex concentrate). Kankakee, IL: CSL Behrine GmbH; 2013. Sarode R, Milling TJ, Refaai MA, et al. Efficacy and safety of a 4-factor prothrombin complex concentrate in patients on vitamin K antagonists presenting with major bleeding: a randomized, plasma-controlled, phase IIIb study. Circulation. 2013;128(11):1234-43. Klein L, Peters J, Miner J, Gorlin J. Evaluation of fixed dose 4-factor prothrombin complex concentrate for emergent warfarin reversal. Am J Emerg Med. 2015;33(9):1213-8. Praxbind (idarucizumab) [package insert]. Ridgefield, CT: Boehringer Ingelheim Pharmaceuticals, Inc; 2015. Schiele F, van Ryn J, Canada K et al. A specific antidote for dabigatran: functional and structural characterization. Blood. 2013; 121:3554-62. Glund S, Moschetti V, Norris S et al. A randomised study in healthy volunteers to investigate the safety, tolerability and pharmacokinetics of idarucizumab, a specific antidote to dabigatran. Thromb Haemost. 2015; 113:943-51. Glund S, Stangier J, Schmohl M et al. Safety, tolerability, and efficacy of idarucizumab for the reversal of the anticoagulant effect of dabigatran in healthy male volunteers: a randomised, placebo-controlled, double-blind phase 1 trial. Lancet. 2015; 386:680-90. Pollack CV Jr, Reilly PA, Eikelboom J et al. Idarucizumab for dabigatran reversal. N Engl J Med. 2015; 373:511-20. Pollack CV, Reilly P, Eikelboom J et al. Idarucizumab for reversal of the anticoagulant effects of dabigatran in patients in an emergency setting of major bleeding, urgent surgery, or interventions. J Am Coll Cardiol. 2016; 67(13 Suppl):664. Andexxa (andexanet alfa) [package insert]. San Francisco, CA: Portola Pharmaceuticals, Inc; 2017. Siegal DM et al. Andexanet alfa for the reversal of factor Xa inhibitor activity. N Engl J Med. 2015;373(25):2413-24. Connolly SJ et al. Andexanet alfa for acute major bleeding associated with factor Xa inhibitors. N Engl J Med. 2016;375(12):1131-41. Steffel J, Verhamme P, Potpara TS, et al. The 2018 European Heart Rhythm Association Practical Guide on the use of non-vitamin K antagonist oral anticoagulants in patients with atrial fibrillation. Eur Heart J. 2018;39(16):1330-1393. Hemphil JC, Greenberg SM, Anderson CS, et al. Guidelines for the management of spontaneous intracerebral hemorrhage: a guideline for healthcare professionals from the American Heart Association/American Stroke Association. Stroke. 2015;46:2032-2060. Ansell JE, Bakhru SH, Laulicht BE et al. Use of PER977 to reverse the anticoagulant effect of edoxaban. N Engl J Med.2014; 371:2141-2. Much controversy exists regarding the optimal duration of bisphosphonate therapy. In 2011, the FDA reviewed available literature regarding the safety and efficacy of bisphosphonates, in which they concluded that efficacy was questionable beyond 5 years of therapy. This led to labeling changes that state: ‘The optimal duration of use has not been determined. All patients on bisphosphonate therapy should have the need for continued therapy re-evaluated on a periodic basis.’ The FLEX and HORIZON-PFT trials aimed to examine the effects of extended duration-bisphosphonate therapy. In the FLEX trial, 1099 postmenopausal women with a T score < -2.0 who previously received alendronate for 5 years were randomized to continue or discontinue alendronate therapy for an additional five years. Total hip bone mineral density decreased in both groups but remained at the same or at higher levels compared to those at initial study enrollment 10 years prior. There was no difference between groups in the rate of nonvertebral or morphometric vertebral fractures, but there was a significantly higher risk of clinical vertebral fractures seen in patients taking placebo compared to those continuing alendronate (5.3% vs 2.4%; RR 0.45; 95% CI 0.24-0.85). The authors concluded that discontinuation of alendronate after five years does not significantly increase fracture risk. However, women at higher risk of clinical vertebral fractures due to factors such as previous vertebral fracture or low bone mineral density should consider treatment beyond five years. In the HORIZON-PFT trial, 1233 postmenopausal women with a diagnosis of osteoporosis who previously received zoledronic acid for 3 years were randomized to continue or discontinue zoledronic acid therapy for an additional three years. Patients receiving zoledronic acid saw a constant femoral neck bone mineral density, while those randomized to placebo experienced a slight drop in BMD. Treatment with zoledronic acid resulted in a statistically significant decrease in morphometric vertebral fracture (14 vs 30, OR 0.51; p = 0.035), but there was no difference between groups in regards to non-vertebral and hip fractures. The authors concluded that patients receiving zoledronic acid for three years may discontinue therapy for up to three years. However, those with high risk of fracture, especially those that are vertebral in nature, could benefit from continued treatment. Why consider a drug holiday? A drug holiday is a disruption of therapy with plans for reinitiation at a later time. Drug holidays are considered for medications that continue to exert an effect after they are stopped. Providers may desire to pause treatment to see how patients respond without therapy or due to the risk of adverse effects from long term use. The concept of a bisphosphonate drug holiday has developed based on available efficacy and safety data. Bisphosphonates accumulate in the bone, which provides continued osteoclast inhibition even after therapy is discontinued. Zoledronic acid has the highest binding affinity for bone, followed by alendronate and risedronate.3 As shown in the FLEX and HORIZON-PFT trial, bone mineral density remains elevated from baseline even after discontinuation of therapy, which suggests continued benefit from bisphosphonate therapy after cessation of treatment. Rare but serious side effects have been reported by patients receiving bisphosphonate therapy. Postmarketing reports have linked the use of bisphosphonates to osteonecrosis of the jaw and atypical femur fractures. Osteonecrosis of the jaw (ONJ) is defined by the American and Canadian Associations of Oral and Maxillofacial Surgeons as exposed bone in the maxillofacial region that has persisted beyond eight weeks in a patient currently or previously treated with a bisphosphonate and no history of radiotherapy to the jaw.7 The overall incidence is 1 in 100,000 patient/years.8 Risk factors like poor oral hygiene, chemotherapy, and glucocorticoid therapy may increase the risk of development of ONJ. Atypical femur fractures are fractures located in the subtrochanteric region and femoral shaft that occur spontaneously or after minimal trauma. A retrospective analysis of femur fractures in American patients found an increased risk of atypical femur fractures in patients treated with bisphosphonate therapy for two years (1.78 per 100,000 patient/years) compared to eight to ten years (113.1 per 100,000 patient/years).9 Although these side effects are rare, they can lead to significant morbidity. By utilizing the long lasting effects of bisphosphonates, duration of treatment can be shortened to decrease the risk of these adverse reactions. 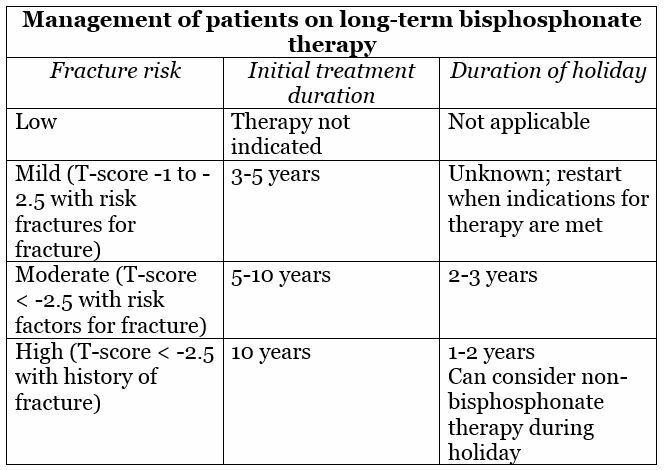 A report published by the American Society for Bone and Mineral Research in 2015 provided an approach to the management of postmenopausal women on long-term bisphosphonate therapy, which is summarized in the table below.10 Initial treatment duration should be based on the patient’s clinical factors, fracture history and risk for future fracture include age, low body weight, fall risk and fall history. There is no data providing information regarding how long a bisphosphonate holiday should last. In patients at low risk of fracture, it is reasonable to withdraw therapy and consider reinitiation at a later time. Although evidence is lacking, it is thought that monitoring bone mineral density and bone turnover markers could assist in guiding bisphosphonate reinitiation. In patients with a history of fracture, drug holidays should be short as the benefit of treatment likely outweighs the risk of rare adverse effects. Non-bisphosphonate drugs like denosumab or teriparatide could be considered during the holiday. Bisphosphonates are first line therapy in the treatment of osteoporosis. Given the longstanding positive effect of bisphosphonates on bone and risk of rare but serious adverse effects, a drug holiday can be considered. Limited data exists regarding the duration of therapy or when to reinitiate therapy after a drug holiday. Decisions regarding initiation and termination of drug holidays should be individualized based on the patient’s history of fracture and risk of future fracture. Osteoporosis Fast Facts. National Osteoporosis Foundation website https://cdn.nof.org/wp-content/uploads/2015/12/Osteoporosis-Fast-Facts.pdf . Updated 2015. Accessed December 29, 2018. Wysowski DK, Greene P. Trends in osteoporosis treatment with oral and intravenous bisphosphonates in the United States, 2002-2012. Bone. 2013; 57(2):423-428. Camancho PM, Petak SM, Binkley N, et al. AACE/ACE practice guidelines for the diagnosis and treatment of postmenopausal osteoporosis – 2016. Endocr Pract. 2016;22(14):1-42. Villa JC, Gianakos A, Lane JM. Bisphosphonate treatment in osteoporosis: optimal duration of therapy and the incorporation of a drug holiday. HSS J. 2016;12(1):66-73. Black DM, Schwartz AV, Ensrud KE, et al. FLEX Research Group. Effects of continuing or stopping alendronate after 5 years of treatment: the Fracture Intervention Trial Long-term Extension (FLEX): a randomized trial. JAMA. 2006;296(24):2927–38. Black DM, Reid IR, Boonen S, et al. The effect of 3 versus 6 years of zoledronic acid treatment of osteoporosis: a randomized extension to the HORIZON-Pivotal Fracture Trial (PFT). J Bone Miner Res. 2012;7(2):243–54. ARuggiero SL, Dodson TB, Assael LA, Landesberg R, Marx RE, Mehrotra B. American Association of Oral and Maxillofacial Surgeons position paper on bisphosphonate-related osteonecrosis of the jaws—2009 update. J Oral Maxillofac Surg. 2009;67(5 suppl):2–12. Khosla S et al. Bisphosphonate-associated osteonecrosis of the jaw: report of a task force of the american society for bone and mineral research. J Bone and Min Research 2007;22(10)1479-1491. Dell RM, Adams AL, Greene DF, et al. Incidence of atypical nontraumatic diaphyseal fractures of the femur. J Bone Miner Res. 2012;27(12):2544-2550. Adler RA, El-Hajj Fuleihan G, Bauer DC, et al. Managing Osteoporosis in patients on long-term bisphosphonate treatment: report of a task force of the American Society for Bone and Mineral Research. J Bone Miner Res. 2016;31(16). We are entering a period in which Americans are living longer with type 2 diabetes mellitus (T2DM) and patient-centered care is paramount.1 Consequently, quality of life, medication adherence, and cost become particularly important considerations. Unfortunately, drug costs continue to rise for mainstay T2DM therapies (or not drop quickly enough, despite an approved biosimilars for glargine U-100), and patients feel the crunch. This has prompted reflection on policies that prioritize use long-acting, basal insulin analogs in our patients at the St. Louis County Department of Public Health. With similar efficacy between NPH and basal analogs, the reduced risk for hypoglycemia, more predictable insulin release, and reduced injection burden have made basal analogs an easy go-to, so long as “insurance is going to pay for it.” Arguably, this mindset has led to basal analogs dominating the global insulin market.2 However, is the cost of these expensive insulins truly gone just because the patient isn’t responsible for a significant portion of the bill? This argument can only really be made for uninsured persons who qualify for patient assistance programs, where medications are sent directly from drug manufacturers at no cost to the patient. For the majority of patients, we have to think big picture – whole health-system big – on an issue like this. The current review will examine the “hows” related to choice in basal insulin: how do these products really compare, and how do we proceed? Pharmacologic management of T2DM is guided by many factors, such as hemoglobin-A1c (A1c), presence of cardiovascular or renal disease, and drug safety, efficacy, route, and cost. In outpatient treatment settings, insulin is typically reserved for persons unable achieve their A1c goal using oral or non-insulin injectable agents alone – and is generally added to versus replacing therapies – or for persons who present with markedly elevated blood sugars and symptoms of hyperglycemia. The main benefit of insulin in T2DM is that it has no therapeutic ceiling, while other agents are limited to an average A1c lowering potential of 0.5-2%. For some patients, insulin is the only agent able to control their blood glucose and is a vital part of their therapy. Basal insulin is often the patient’s first introduction to insulin, due to its relative ease of use and dosing titration. Basal insulin can be broken into two types: human insulin and insulin analogs. The most widely used human insulin is Neutral Protamine Hagedorn (NPH) insulin, which is intermediate-acting. NPH is human insulin made using recombinant DNA technology and formulated in an isophane suspension.3 Its onset of action ranges 1-2 hours with a peak at 4-12 hours, and a duration of action ranging 12-24 hours. Basal insulin analogs are structurally altered to prevent metabolism and provide a flatter time-action profile, or a “peak-less” insulin release. Examples of basal analogs include: insulin glargine (U-100, U-300), detemir and degludec. The onset of action for analogs is 3-4 hours (longer for glargine U-300). However, insulins glargine & degludec have a peak-less profile, while detemir has a minor peak at 3-9 hours. Furthermore, the duration of action for insulin glargine is 22-24 hours (U-300 is >24 hours), while detemir is dose-dependent between 6-23 hours (duration increased with unit/kg ratio). Clinical practice guidelines indicate different preferences when it comes to using basal insulin. The 2019 ADA Standards of Medical Care states basal insulin is a convenient initial insulin regimen and doesn’t give strong preference towards any particular product.4 They mention that analogs have shown reduced symptomatic and nocturnal hypoglycemia compared to NPH in clinical trials, but that development of hypoglycemia is similar between agents in practice. The 2018 ADA/EASD Consensus Statement also does not indicate a preference for basal insulin.5 However, 2018 AACE/ACE Consensus Statement states insulin analogs are preferred over NPH insulin due to the “flat serum insulin concentration for 24 hours or longer”.6 In contrast, large health plans like Kaiser Permanente explicitly prefer NPH over analogs in their treatment guidelines.7 To reconcile differences between treatment guidelines, a review of randomized control trials and real-world data is needed. To evaluate whether or not the two types of basal insulins are similar in efficacy is crucial when weighing basal insulin options for your patients. A Cochrane systematic review and meta-analysis compared NPH to insulin glargine (n=6) & detemir (n=2) using data from eight randomized control trials (RCT).8 They measured efficacy by comparing mean changes in A1c from baseline to end of trial, pooling results using a random-effects model. Results showed there was no statistical difference in efficacy outcomes between the two types of basal insulin. Unfortunately, most of the trials had a short duration (6 months). More recently, Rosenstock et al. conducted an analysis of data from an open-label five year RCT comparing once daily insulin glargine to twice daily NPH insulin.9,10 The trial was originally designed to better understand the long-term differences in retinopathy progression, but measured other outcomes including glycemic control and hypoglycemia. The difference in change from baseline HbA1c was found to be significantly lower in the NPH group -0.19 (p=0.012).9 Although statistically significant, a difference of only 0.19 is not considered clinically significant. Progression of diabetic retinopathy was similar.10 Unfortunately, results from RCTs often have limited generalizability to practice in real-world settings, particularly when it comes to adherence. Lipska et al. conducted large cohort study utilizing data from the Kaiser Permanente North Carolina Diabetes Registry (n=25,489) over a mean follow-up of 1.7 years.11 Results again showed a statistically significant difference in glycemic efficacy favoring NPH insulin with a mean difference in A1c -0.22 [95% CI -0.09, -0.37]. Adherence was similar between groups. From a glycemic efficacy standpoint, there is no reason to anticipate better results with basal analogs over NPH. However, data are still limited for macro- and microvascular outcome differences between NPH and basal analogs, due to the long follow-up period needed to observe these outcomes. For patients susceptible to symptomatic hypoglycemia, choice of basal insulin therapy needs to be made carefully, particularly in persons with established cardiovascular disease. Severe hypoglycemia (hypoglycemia requiring third party assistance) was evaluated in six of the eight trials included in the Cochrane review.8 Results showed no significant difference between glargine and NPH, with an OR 0.70 [95% CI 0.4, 1.23], or between detemir to NPH OR 0.50 [95% CI 0.18, 1.38]. It’s important to note that none of the trials were adequately powered to evaluate severe hypoglycemia – which had an overall low incidence – and that the subjective definitions used for severe hypoglycemia and lack of adequate blinding introduce bias. Results are confirmed in other analyses, even in persons more vulnerable to the deleterious effects of hypoglycemia, such as older adults > 65 years.12 Results from the long-term RCT by Rosenstock et al. showed increased risk for severe hypoglycemia (hypoglycemia requiring assistance and BG < 56 mg/dL or prompt recovery after reversal using oral/IV glucose or glucagon) over 5 years with a RR 0.62 [95% CI 0.41, 0.95].9 However, the large cohort study by Lipska et al., for which the primary endpoint was the incidence of hypoglycemia-related emergency department visits (ICD-9 coding), there was no significant difference in severe hypoglycemia between NPH and analogs (glargine or detemir) HR 1.16 [95% CI 0.71, 1.78].11 In conclusion, results for severe hypoglycemia are mixed and tend to favor analogs (glargine), particularly in long-term study settings. However, the majority of data indicate similar incidence of severe hypoglycemia in both RCT and real-world settings. Although the Cochrane review found no significant differences in severe hypoglycemia, authors did see a significant increase in risk for symptomatic hypoglycemia (16-18%) and nocturnal hypoglycemia (34-37%) with NPH compared to basal analogs (glargine and detemir).8 Other meta-analyses have confirmed similar results.13,14 Symptomatic hypoglycemia was variably defined in the Cochrane review, including: symptoms of hypoglycemia, BG measurements, or both meaning bias is possible in these studies as well. In the long-term RCT by Rosenstock et al., rates of symptomatic hypoglycemia confirmed by a blood glucose readings favored glargine over NPH for mild, symptomatic hypoglycemia (BGs < 70 mg/dL) (HR 0.70 [95% CI 0.56, 0.87]) and nocturnal hypoglycemia (HR 0.75 [95% CI 0.58, 0.97]).9 Authors report a corresponding number needed to harm (NNH) of 19 [95% CI 10, 1213] for symptomatic hypoglycemia (BG < 70mg), which is considered clinically relevant. NPH insulin is an acceptable basal insulin in T2DM, generally given once or twice daily and in addition to first-line oral agents (e.g. metformin). NPH insulin has similar efficacy and safety to basal analogs, though symptomatic hypoglycemia and nocturnal hypoglycemia risk is consistently higher. Long-term studies also indicate higher risk for severe hypoglycemia after years of use. NPH should be first-line for persons indicated for basal insulin, unless patients have high-risk for hypoglycemia or comorbidities particularly susceptible to hypoglycemia, such as cardiovascular disease. The decision should be individualized. Clinicians should comfortable initiating NPH and/or changing between NPH and basal analogs. Kaiser Permanente’s NPH initiation and titration guidelines are summarized in Table 1. If symptomatic hypoglycemia occurs in patients on any basal insulin, clinicians should consider switching patients to a basal analog. The US Burden of Disease Collaborators. The state of US health. 1990-2016: burden of diseases, injuries, and risk factors among US states. JAMA. 2018;319(14):1444–1472. Beran D, Ewen M, Lepeska M, et al. Access to Insulin: Addressing the Challenges and Constraints. Health Action International. http://haiweb.org/wp-content/uploads/2017/03/Issues_Paper_2017.pdf. Accessed: January 2019. Wolters Kluwer Clinical Drug Information, Inc. (Lexi-Drugs). Wolters Kluwer Clinical Drug Information, Inc. https://online.lexi.com/lco/action/home. Accessed: January 2019. American Diabetes Association. 9. Pharmacologic Approaches to Glycemic Treatment: Standards of Medical Care in Diabetes—2019. Diabetes Care. 2019;42(Supplement 1):S90-S102. doi:10.2337/dc19-S009. Davies MJ, D’Alessio DA, Fradkin J, et al. Management of Hyperglycemia in Type 2 Diabetes, 2018. A Consensus Report by the American Diabetes Association (ADA) and the European Association for the Study of Diabetes (EASD). Diabetes Care. 2018;41(12):2669-2701. doi:10.2337/dci18-0033. Kaiser Permanente Washington Team. Type 2 Diabetes Screening and Treatment Guideline. KPWA. https://wa.kaiserpermanente.org/static/pdf/public/guidelines/diabetes2.pdf. 2017: 1-19. Lipska KJ, Parker MM, Moffet HH, et.al. Association of initiation of basal insulin analogs vs neutral protamine Hagedorn insulin with hypoglycemia-related emergency department visits or hospital admissions and with glycemic control in patients with type 2 diabetes. JAMA. 2018;320(1):53–62. Bazzano LA, Lee LJ, Shi L, Reynolds K, Jackson JA, Fonseca V. Safety and efficacy of glargine compared with NPH insulin for the treatment of Type 2 diabetes: a meta-analysis of randomized controlled trials. Diabet Med. 2008 Aug;25(8):924-32. Owens DR, Traylor L, Mullins P, Landgraf W. Patient-level meta-analysis of efficacy and hypoglycaemia in people with type 2 diabetes initiating insulin glargine 100 U/mL or neutral protamine Hagedorn insulin analysed according to concomitant oral antidiabetes therapy. Diabetes Res Clin Pract. 2017 Feb;124:57-65. Tricco AC, Ashoor HM, Antony J, et al. Safety, effectiveness, and cost effectiveness of long acting versus intermediate acting insulin for patients with type 1 diabetes: systematic review and network meta-analysis. BMJ. 2014;349:g5459. doi:10.1136/bmj.g5459.